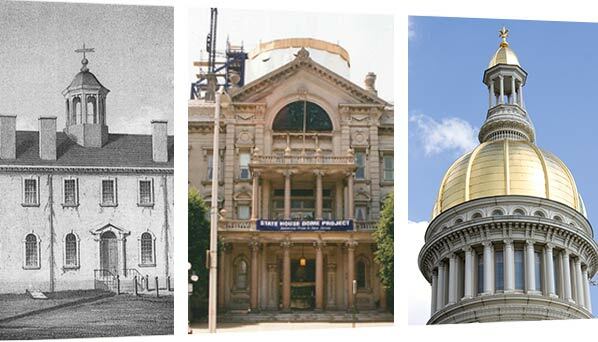 The New Jersey State House is situated on historic West State Street, where turn-of-the-century row homes and newer office buildings house advocacy groups, small businesses and Thomas Edison State University. Located directly across the street from the front of the State House, New Jersey’s World War II Memorial honors the courage and sacrifices of our “Greatest Generation” of citizens. The overall theme of “victory” is expressed through sculptural elements, service markers and story walls. Interpretive kiosks broaden the visitor experience and amphitheater seating allows for reflection. Looking at the front of the State House, across the street and around to the left is Petty’s Run. An archaeological site marking part of our capital’s storied past, Petty’s Run began as a plating mill in the 1730s. A steel furnace occupied the site beginning in the 1740s and would be used in making gun barrels and bayonets for the Revolutionary War. In the autumn of 1776, as the British advanced upon Trenton, patriots demolished the mill to avoid it from falling into enemy hands, with merchants restoring it years later. It was one of only five steel furnaces in the 13 colonies and the only one known to survive. From here, you will have an unobstructed view of the State House Dome. Continue behind the State House, turn right and climb the stairs at the left edge of the lawn. Centuries ago, native Lenape tribes made use of the Delaware River for wampum (shell beads used for currency), fishing and as a seasonal hunting ground. European settlers valued it for powering mills and for transportation, with barges moving north to south and back and forth to Pennsylvania. (Our capital is the only one where another state can be viewed unaided.) George Washington and his troops famously crossed the river on Christmas in 1776 for a surprise attack on enemy forces, in what would become considered the turning point of the Revolutionary War. Continue along the walkway until the paved area extends to your right. 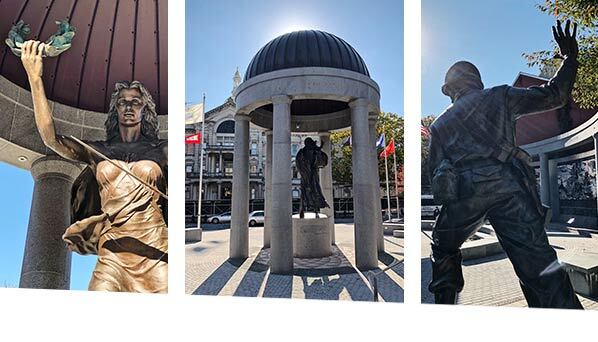 The Plaza includes three notable installations constituting a work of art entitled “Confluence.” A raised platform is engraved with a historic map of Trenton as it was at the time of the State House’s origination – denoted in the center. 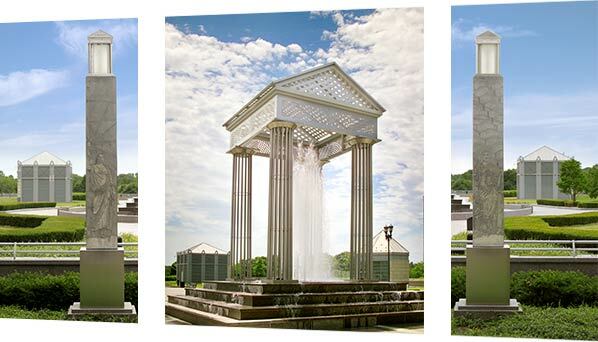 The steel canopy central to the Plaza is part of a seasonal water sculpture with oval seating showing the names of 567 New Jersey municipalities. At the end of the path (and best seen by walking through and looking back) are two stone obelisks depicting the figures of Liberty and Prosperity, which are illuminated in the evening by internal fiber optics. Proceed to the sidewalk outside the Plaza and turn right. Built from 1927-31, the State House Annex originally housed the State Museum, State Library and judicial offices, including the State Supreme Court. Exterior engravings on the two wings praise New Jersey’s government and the forbearers who sacrificed for our emerging state and nation. Intricately etched bronze doors pay tribute to our state’s history and industry. The Annex now houses legislative offices and committee rooms.